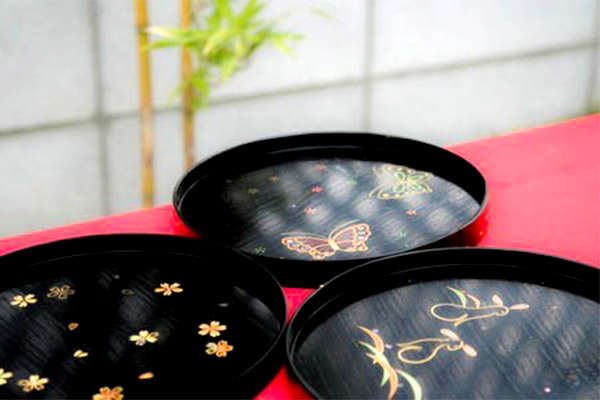 Don't miss a chance to try your hand at raden, one of the decorative techniques of Kyoto lacquerware. You can take the decorated tray with you on the same day. Choose the desired shape of mother-of-pearl, pick it up with the tip of a bamboo skewer and glue it to the surface of the tray. After that, you will draw a pattern with some cashew lacquer on a fine brush and apply maki-e (for that, you will sprinkle some gold dust over the traced pattern) and give your craftwork the last finishing touches. Have fun making your own handcrafted souvenir from Kyoto!